"You are a father of a girl? I pity that girl." 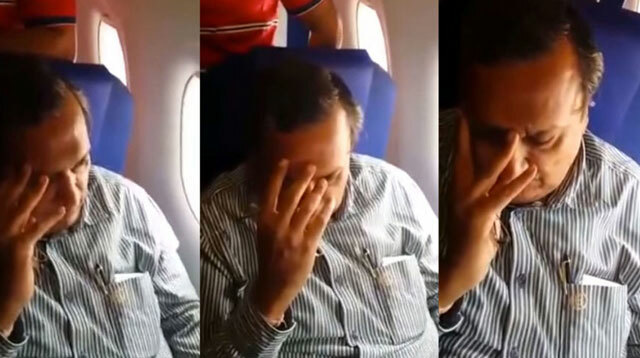 YouTuber Shreyas Rao has gone viral after uploading a video of a woman calling out a man trying to touch her inappropriately during a flight. The first video contains dialogue in Hinglish, but thanks to a translation from BuzzFeed India, we can understand that the irate young woman accuses the man of taking advantage of her, and expecting her to keep quiet. Girl: "You're asking for forgiveness. Why? Because I'm a girl? And you have the right to touch me any time, anywhere you want to?" Man: "I'm asking for forgiveness." Girl: "What forgiveness are you asking for? Did you do it only once? Was it by mistake? Look at how old you are. Old moron. Half way into your grave and still not wise enough. Say more? Say more, come on. I'm videotaping you, mister! If you ever do this again, you'll remember this episode. You think us girls stay silent and you can do anything, right? Look here. Why are you so bashful now? I will call security. I'll make sure I make a complaint." Man: "I'm sorry about it. Please, stop it." Girl: "Why? Why, please? I'm sorry, please. I'm sorry that I'm a girl! Please, forgive me, for I dare to travel alone as a woman. I'm so sorry for that! I will not leave you. Don't think [sic]." Girl: "Yes, I have purposefully done that. You thought you could do it again, right? You were touching me here again the second time. You thought I didn't know what was going on and I would stay quiet, right? Only us girls are expected to have shame. You have a right to be shameless." The fella in question repeatedly insists his actions were a "mistake" and seems to believe that offering a "written apology" will make up for his disgraceful behavior. But the victim responds cleverly, saying "So things like murder—these are mistakes?" The conversation then moves on to how the harasser would feel if it was his wife, daughter or sister being treated with such disregard, at which point he admits that he has a daughter himself. "You are a father of a girl!" the young woman asks. "With this audacity? I pity that girl." Hats off to the young woman for standing up for herself and all other women who have been victims of sexual harassment. If only more women felt able to do the same, perhaps it would become widely understood that such behavior is wholly unacceptable. This article originally appeared on Cosmopolitan UK. Minor edits have been made by the Cosmo.ph editors.